Tualatin Estate Vineyard, established in 1973 by wine pioneer Bill Fuller, is one of the oldest and most respected vineyard sites in Oregon's Willamette Valley. Wine grapes from this 145-acre vineyard have produced world-renowned wines for nearly 45 years. Tualatin is the only vineyard to have won the Best of Show for both the red and white categories at the London International Wine Competition in the same year. Tualatin’s Pinot Noir captured the Governor’s Trophy, Oregon’s most prestigious wine award, two years consecutively in 1994 and 1995. This is a feat unduplicated by any Oregon winery. 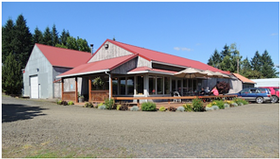 Tualatin Estate Vineyard is proudly owned and operated by Willamette Valley Vineyards since 1997. The name “Tualatin” originates from local indigenous people and means “gentle and easy flowing,” referring to the Tualatin River that meanders on its way to the confluence with the Willamette River. The site is located in the coastal rain shadows near Forest Grove, Oregon. It is planted with sixty-five acres of Pinot Noir, fifteen acres of Chardonnay, twenty-nine acres of Riesling, six acres of Gewürztraminer, ten acres of Muscat and nine acres of Pinot Blanc. Our most recent plantings reflect the site’s affinity to ripening Pinot Noir, with forty-five new acres planted to seven different French clones, all grafted onto phylloxera-resistant rootstock. The new plantings are spaced at twice the plant density of the original vineyard to improve vineyard ripening potential by limiting the crop on a per plant basis. This will yield wines that are more consistent from year to year as well as more complex structurally due to the clonal diversity. Flights waived with the purchase of two bottles. Wine Club Members and Owners receive a complimentary tasting. Take a private tour and tasting of our Tualatin Estate Vineyard led by Winery Ambassador Brandon Gruber. Explore our oldest, most historic vineyard and learn the fascinating history and stories behind the vines. The cost is $20 per person, or $15 for Wine Club Members, Owners and their guests. Price includes a private walking tour of the vineyard, wine tasting flight, small charcuterie plate and a $10 wine credit to use on your favorite wine of the day. Available by appointment only and offered at 11 am and 5 pm on Saturdays and Sundays. To inquire about other dates and times, please call. Contact Brandon Gruber at Brandon.Gruber@wvv.com or 503-588-9463 to book your reservation. A credit card is required to hold your reservation. There is a $10 per person cancelation fee for tours not canceled within a 48-hour notice. Please note that this is a walking tour that goes into the vines and will include some inclines; please wear comfortable and appropriate footwear.